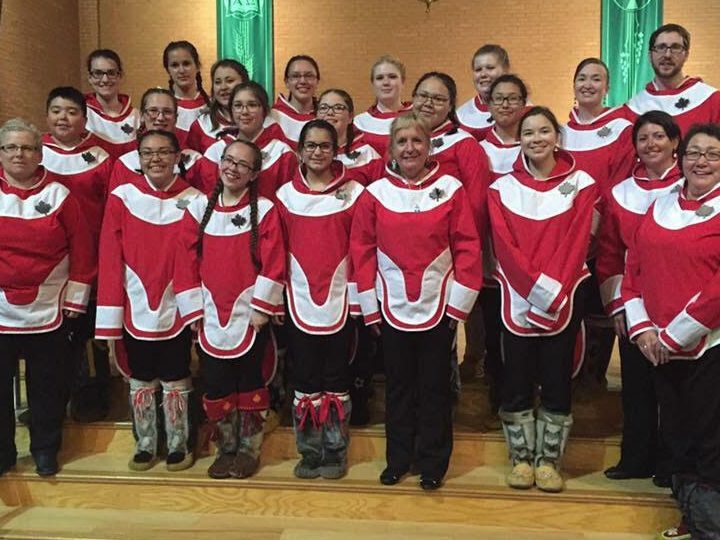 Ullugiagâtsuk Choir is an auditioned choir with choristers in grades 7-12, from the five Nunatsiavut communities: Nain, Hopedale, Makkovik, Postville and Rigolet. The students practice in their own communities, in addition to group workshops 2-3 times a year, prior to performances. Their performances are in both Inuktitut and English and are highlighted by drum dancing and throat singing. Ullugiagâtsuk Choir members were proud to participate in The Unisong Festival 2017, to celebrate Canada’s 150th birthday in Ottawa. Our commissioned piece, “Music of the Land”, created from the poetic words of Gary and Barbara Mitchell and Kathleen Allen’s musical composition was sung by over 600 singers, accompanied by the National Arts Centre Orchestra. It was with great pride that Ullugiagâtsuk Choir performed during the Residential School Survivors’ Official Apology Ceremony, November 24, 2017. The choir performed at Come and I Will Sing You! Opening Gala, Podium 2018, St. John’s NL and “…float…” on Canada Day 2018. They proudly highlighted in their performance with Song of the Land by Deantha Edmunds-Ramsey. Music was a way of life for Janet from an early age. Her school years were highlighted with choir participation, that evolved into teaching her own classroom music as a young teacher and co-directing school choirs. Janet’s love in music led her to taking executive roles on provincial and regional arts boards: Melville Music Festival (chair), Festival 500 Sharing the Voices (board member), Creative Arts Festival (board member), Eastern Arts Alliance (founding board member), and Choral NL (board member). Her volunteer efforts were recognized with the Happy Valley- Goose Bay Fine Arts Award. Janet co-founded the Ullugiagatsuk Choir, with Kellie Walsh, after coordinating the Pan Labrador Experience for many years. The choir was created to showcase the choral and cultural abilities of the youth of Nunatsiavut. It is indeed a great privilege for Janet to share this talented group of choristers with the choral community.